Time is the sneakiest of thieves, especially adept at stealing the best years of our lives. Its taunts leave behind a dank old pile of used up memories, constant reminders of what is gone, reminders of the way things were, when we were not so old, when memories didn’t mean so much, when we were young, when memories didn’t mean a thing. Sam the Lion (Ben Johnson): You don’t even care if it was your last game. You ain’t ever gonna get stomped for your own high school ball team again. Where’s your school spirit? What the hell are we supposed to do with all these damn memories anyway? Pack ’em away in a trunk for winter just so we can dust them off in the spring? Sure, sure, it is better to have loved and lost than to never have loved at all. Lois Farrow (Ellen Burstyn): I guess if it wasn’t for Sam, I’d have missed it, whatever it is. I’d have been one of them Amity types that thinks that playin’ bridge is about the best thing that life has to offer. Nostalgia is a wicked game, preying upon our yearnings to relive moments past, but with no regard to cost. Ultimately, the inability to bridge the gap leaves the searcher wounded, oozing regret. We can’t possibly be the face in the picture. Not now. Moreover, the memories we replay in our minds are snapshots printed with invisible ink. We are reduced in recollection to hazy silhouettes on a foggy timeline: nervous virgin, scorned lover, cheery schoolgirl, jaded mother, a plotting boy in the yard, a grizzled old man in the mirror. Sam: If she was here I’d be just as crazy as I was then in about five minutes. Isn’t that ridiculous? … No, it ain’t really. Being crazy about a woman like her is always the right thing to do. Being a decrepit old bag of bones, that’s what’s ridiculous. Getting old. The real kicker: transitions that come without warning. Naivety renders us helpless as we make the most important decisions of our lives. Innocence was only on loan before it was ripped away completely, before it was returned to the great unknown. It all happened so fast. There was no time to brace, nor time to grasp the weight of significance along the way. Ruth Popper (Cloris Leachman): When I was twenty years old, I thought hairy-chested football coaches were about it. It can be chilly, this trip down memory lane. 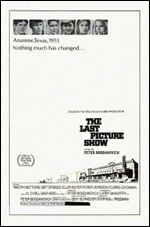 A film’s title, The Last Picture Show, flashes quickly, unexpectedly. A panoramic shot of a seemingly empty town surfaces. The old movie theater is front and center. It is closed now, vacant except for a whispering wind that blows over the stories of lives fading to black. Teacher (John Hillerman), quoting Keats: Beauty is truth, truth beauty, -that is all/Ye know on earth, and all ye need to know.